Please note – the YELLOW ROUTE may NOT be available for all performances. Please look for a sign on the park gate. For winter evening performances head towards the spotlight at the end of the path. For some performances it may be possible to allow entry through the door at the first corner of the building. If driving by car to the performance please use the Gloucester Street Car Park behind the Library. Parking is currently free after 6pm and all day Sundays. A ticket will be required for Saturday matinée performances only (currently £1 for 3hrs) and requires keying in your car registration, so leave yourself plenty of time. For safety reasons, public parking is not available anywhere in the school grounds except for blue badge holders, if weather permits. Public vehicle access and parking is prohibited in the narrow private road leading to the school. Please do not enter this road in order to drop off members of the cast or other passengers. Directions by car – Follow the RED ROUTE into Gloucester Street and park in the Car Park behind the Library. 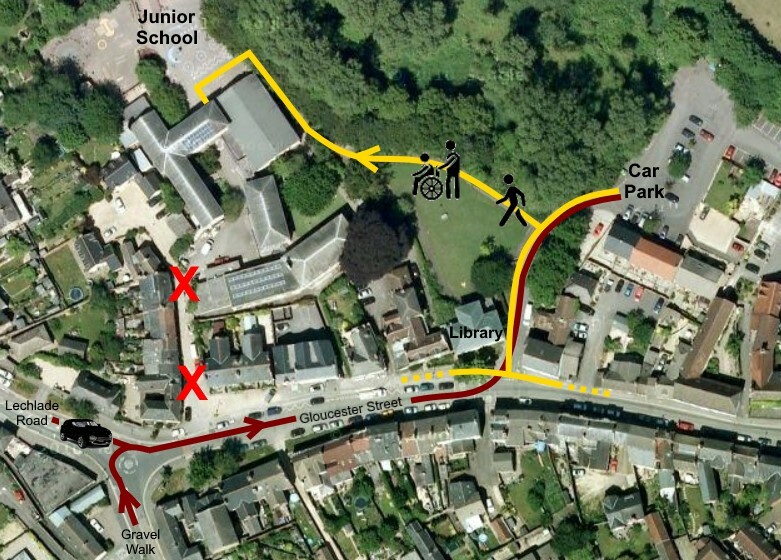 Follow the YELLOW ROUTE (150 yards) on foot back out of the car park, turn right through the gate onto the green behind the library and continue to the school gate. For some performances it may be possible to allow entry through the door at the first corner of the building. Otherwise keeping to the right go around the outside of the school hall and you will find the entrance under the archway. If this route is not available then follow the ORANGE ROUTE (250 yards) going back past the Library into Gloucester Street and turn right. After a 100 yards there will be a sign on the pavement indicating the small lane that leads to the School. Directions on foot – Follow the ORANGE ROUTE along Gloucester Street to just east of the mini-roundabout. There will be a sign on the pavement indicating the small lane that leads to the School. FDS Members – Could all FDS members coming to see the performance and therefore NOT involved in the cast or crew at that time please also use the Gloucester Street Car Park. Please could all members of the cast or crew who need to park inside the school please arrive well before the public, at least half an hour before the start of each performance*. Please take extra care when driving through the school and especially when passing through under the arch way. Please note that there must be no permanent parking at the top end directly inside the gate as this area will be reserved for disabled parking only.